Uncooked orzo - thanks to yaseminskitchen for the photo. Orzo resembles a large grain of rice (risoni) but is in fact a type of pasta. Orzo means barley in Italian and it’s the Swiss army knife of pasta shapes; for example, it can be used in soup, as a side salad, and even baked in the oven. Our Italian mother, used orzo primarily in soups such as chicken brodo and, at times, in her wonderfully simple lentil soup. 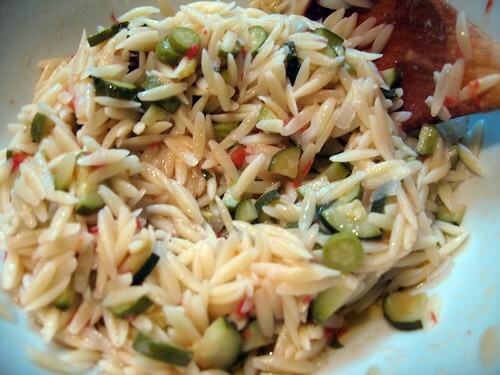 We particularly like using orzo in salads where it works well with just about any ingredient and condiment/sauce. We often make a large portion and keep it in the fridge to serve along side a piece of grilled fish or as a quick, and light, starter before a multi-course meal. Our Orzo Salad with Zucchini, Tomatoes, Basil, and Parmigiano-Reggiano is easy to prepare and might just become your go to Italian side dish! Begin by boiling water for the orzo and cook the pasta al dente. In a separate pan, add the garlic and olive oil and saute for 3-4 minutes. Add the chopped zucchini and saute for 10-12 minutes or until the zucchini begin to soften. Add freshly cracked black pepper and Kosher salt and mix well. Add the tomatoes and saute for 5 minutes. Add the basil and a bit more fresh olive oil and mix well. Grate fresh Parmigiano-Reggiano over the mixture and mix well.